Getting toys when you were a kid was definitely fun – after all, who did not like play, and would mope around all day long if it was too boring? After all, holidays are meant to be full of fun and laughter, and burying one’s nose in a school textbook is definitely far from being the idea of fun for many a child. Having said that, toys that are battery powered tend to cost a whole lot in the long run – due to the number of new batteries that you would need to purchase. However, what if there was a mechanical toy that could run perpetually – as long as there is sunlight? 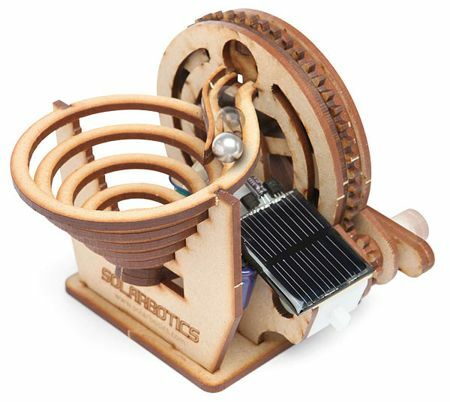 Enter the $34.99 Solarbotics Perpetual Motion Marble Kit. The Solarbotics Perpetual Motion Marble Kit, as its name suggests, would be able to move marbles around using nothing but the sheer generosity of solar power alone. This is a DIY kit that one will be able to build from scratch – and fall in love with basic engineering along the way. It is a snap to put together thanks to some solder, glue, and tools which ought to be readily available in any home, resulting in a neat looking solar powered device on your desk. Its solar cell will do the hard work of collecting solar energy, before releasing it in pulses to turn the gear wheel. The gear wheel in turn elevates marbles to the top, before letting them off down a twisty slide.